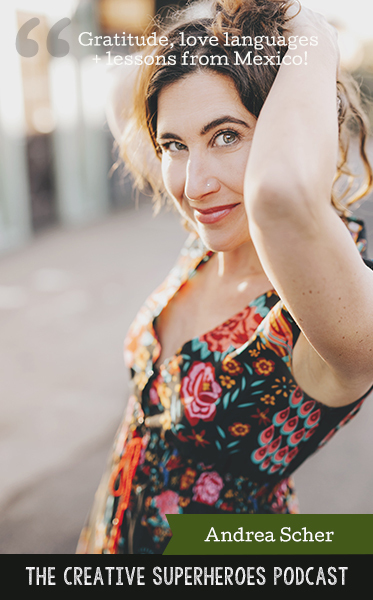 CSP #42: Solo Episode with Andrea: Gratitude, love languages + more. Andrea Scher, CPCC is an artist, an online workshop teacher and a big believer in the transformative power of creativity. Through her e-courses – Mondo Beyondo, Superhero Photo, Cultivating Wonder and more – Andrea inspires people to live authentic, colorful, and creative lives. She is best known for the award winning blog – Superhero Life. If your intuition is pulling you toward Superhero School, I’d love to have you! This 4-month small coaching program begins Monday, February 4th, 2019. Lots more info + opportunity to register here. Just 20 spots this time. I hope it’s you! « CSP #41: Solo episode with Andrea: The importance of choosing ourselves.